Engine hours approximate. All mechanicals meticulously maintained and lots of spares included. During the 1950s and ’60s the Rampart Boat Building Works was one of the best known motor yacht yards in England. It had a reputation for building sturdy, quality gentlemen’s motor boats that were traditional in style while being fast, well specified and having good seakeeping abilities. The Rampart 48 was at that time their biggest and they built just one a year. Each boat has a different fit out, bespoke to their buyer's original specification. This particular layout makes her ideal for living aboard, plenty of accommodation without sacrificing deck space and still very much fit to go to sea. She's only in her second ownership since build and has the advantage of always being maintained to a high standard. 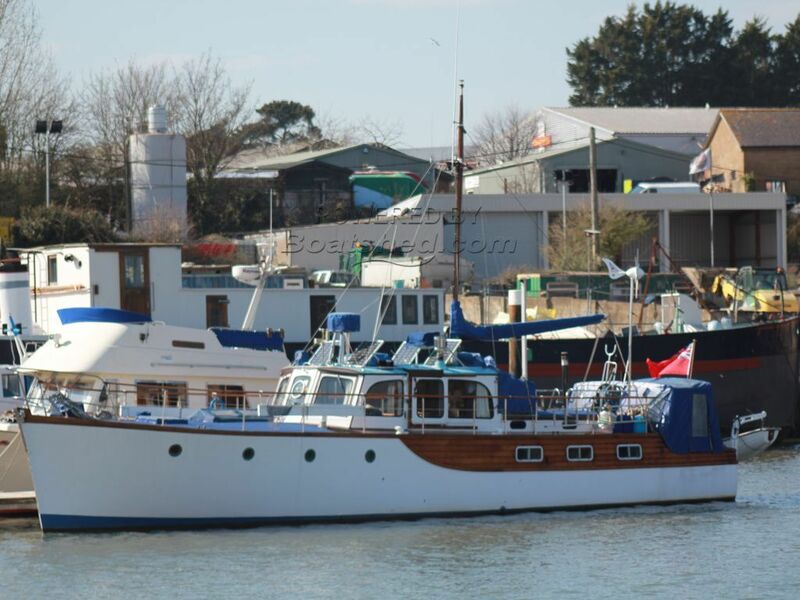 Whilst still mainly original she has been modernised cleverly and has all the home comforts required. That said she is very much in commission and with some normal stowing for sea (everything has a place) you'd be off the dock and heading out in no time. This Rampart 48 has been personally photographed and viewed by Corinne Gillard of Boatshed IOW. Click here for contact details.